Hello friends,I hope you all are fine. Scheduling mails for future posting has been a great need nowadays as most Services do not provide an option to schedule mails for future sending but now we can do it easily using an online services known as LetterMeLater. The name of this online tool itself prescribes its work. However, I used it and found it really Good to use. 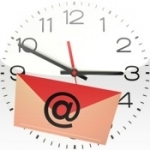 Well, LetterMeLater is an online service to schedule your mails for future posting. As our Accounts like Gmail and Yahoo do not provide this option by default, we can use this third party online tool to schedule mails. LetterMeLater is the best utility to perform the task of scheduling mails easily because it provides many user friendly options like adding attachments, Contacts and Mailing Lists,etc. So, whenever you might cannot get in touch with Internet or out for vacations, you can use this service to schedule Mails. So, let us see how we can do this. You will be shown up with the registration page. Fill the details and Click on Create Account. Now verify your account by opening it and clicking on the confirmation link sent my LetterMeLater. After clicking, your account will be activated. You will be shown your account Page. Click on Compose button to send a new mail present at the top right corner. Now you will be shown a page where you can compose your mail. In the To field, enter the mail to which you would like to send mails. Enter the Subject if needed. Now you will be seeing something in the form of Calendar Icon. Click on it to schedule your Mail Accordingly. 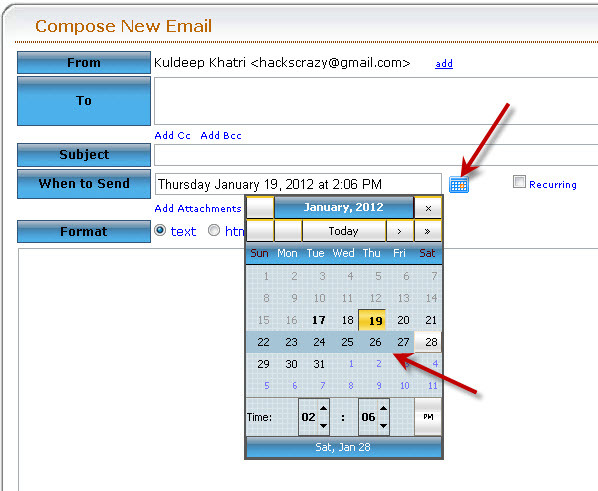 Click on the Calendar Icon and choose the date and time you would like to schedule your mail. Finally click on Schedue Mail to be Sent! That's all! Your mail would be sent to the respective recipient at the scheduled time!